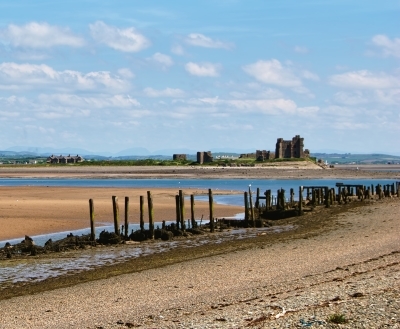 Piel Island has a long and interesting history and is of considerable importance in the local area both because of its links to Furness Abbey and as a major deep water harbour. There is evidence of human occupation spanning at least the last 3000 years. Piel Island was probably visited by the Celts and later by the Romans during their conquest of Britain. The first recorded name of the island, Foudray, came from the Scandinavian settlers to the area. The name Foudray or Fotheray comes from the Old Norse for fire island - meaning a fire beacon to guide boats. Foundray may have been used as a foddering place for the settlers' grazing animals. In 1127 the island was given to the Savignac monks as part of their original land for an abbey from King Stephen to the Abbot of Savigny in Normandy. By order of the Abbot, Furness Abbey became Cistercian in 1148. Furness Abbey started to grow and Foudray fulfilled their need for a safe harbour. In 1212 King John granted the Abbey a licence to land one cargo of "wheat, flour and other provisions" in order to stave off a famine caused by the failure of the local harvest. It is likely that some form of structure existed to house cargos entering the port especially as the trade from Piel to Abbey lands in Ireland increased during the 13th Century. The "Port of Furness" was by this time well established and the trade in corn considerable. In 1327 Furness Abbey was granted the right to crenellate "fortify" its existing dwelling house. Until 1874 the ownership of the island was divided between the Duke of Buccleuch who owned the castle and the Ship Inn and a Mr C W Archibald who owned the rest. The Duke purchased the remainder of the land in 1874 and spent a considerable sum on maintenance to the crumbling castle. In 1919 the Duke decided to sell the entire island and a prospectus was drawn up. The intervention of the mayor of Barrow, Alfred Barrow in August 1919 with a request that the island be given to the town halted the sale. The entire island was given over to the town of Barrow-in-Furness in 1920 as a memorial to those who lost their lives during the First World War. The guardianship of the castle was transferred to the Secretary of State for the Environment in 1973 from whom it passed to English Heritage.